FileChucker lets you present custom forms to your users, from the simple to the complex. You can optionally accept files with the form data as well. The submissions can be saved to your database and/or delivered via email to you, with notifications back to the user as well. And FileChucker's admin console lets you review all the submitted data in one place. It's easy to install, or we can install it for you, and we offer free tech support 7 days a week. It does what we need it to and more! Pros: pretty easy to configure as long as you have some basic coding knowledge, it does exactly what we need - well more than what we need, but that's what's great about it. You can configure it around your needs. Cons: We ran into some issues with the latest version and placing it an iframe. We went back a couple of versions and it works fine. My guess is there is some extra security in the newest version that wasn't compatible with our server/website set up. The support is stellar though and he helped us troubleshoot the problems that were coming up for us. 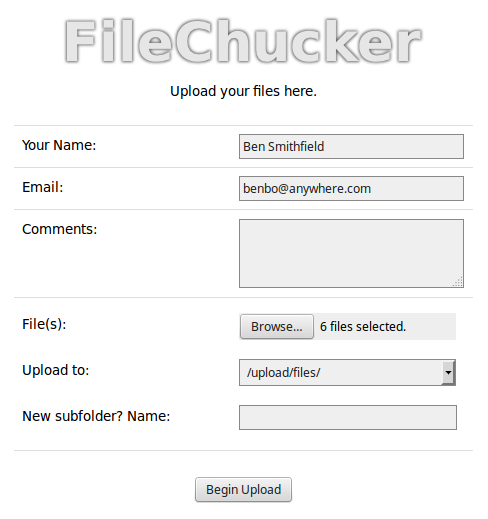 Overall: We have used file chucker since it was pretty much created. There was a point a few years ago where we needed to upgrade our server service and upgrade file chucker, but unfortunately things didn't match up so well with our upgrade. We looked high and low for another script that did the same thing but without luck. There were programs that had an aspect or two or we found several programs that together would do something similar. Of course there are pay services that take you away from the website, but all in all, these options were always missing just a bit. All we needed was a simple file upload program, with a configurable form, that sends an email confirmation/summary to the user as well as sends us a notification that files have been sent. A progress bar was something that was really important for us as we have Clients sending large image files. Well we finally switched servers and are using a newer version of file chucker and it's been great so far. Sorely missed! We've been able to fairly easily customize the look and feel of the script to match our branding which was also important to us. Anthony has given top tier support with any issues that we've had getting this up and going and has always been really responsive. I fully recommend file chucker if you have a need. Recommendations to other buyers: get it if you don't want to pay a monthly/yearly subscription fee and want a product that is embedded in your website. We never liked the idea of a client being rerouted somewhere else. Overall: We have had Filechucker on our site since 2007 and it is the only app that is still going strong . There is no better program of its type out there, you can take my word for it. Been using it for over 3 years without a flaw! No other file transfer solution fares as well we believe. So versalite. Great support. Comments: Our business needed a full proof system for clients to send photos and image files for creation of family albums/story books. No other online solution fares as well as FileChucker by Encodable, and we did try a few others. 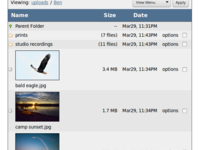 Many files can be listed before uploading in one hit. An essential progress bar shows the progress of the total upload. 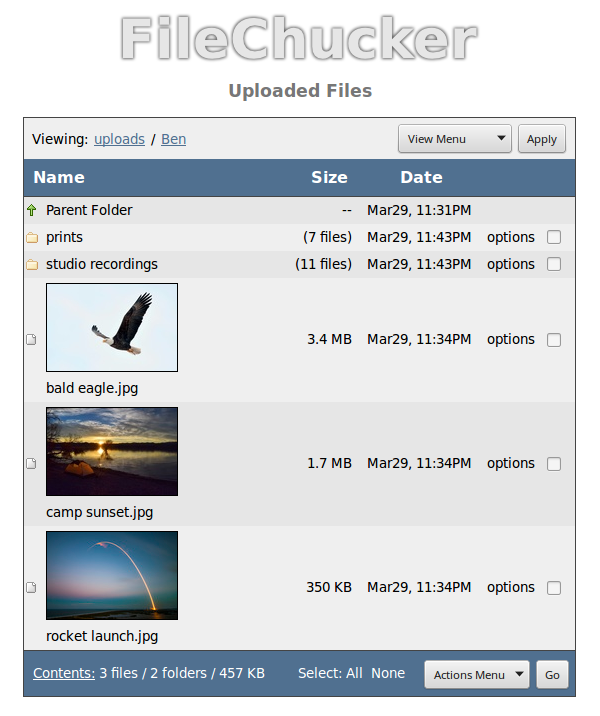 Our clients can create a sub folder by name to upload their files to and upload size has no limit. We do require a client to login and from there, these clients can upload to their user folder on our server. Well of course, UserBase by Encodable was our choice for client login. The two installations integrated beautifully. So generous and obviously proud is Encodable Industries with their products, they offer their time to make sure they are successfully installed and operational. The result is stunning and flawless. The list of preferences you can set is amazing and, I believe, covers every possible configuration. We also setup file uploading for 'non members' too at no extra cost. His/her entered name becomes the upload directory name. So versatile is this product. Comments: I've used and recommended FileChucker several times, and just finished setting up a new instance at my current place of employment. Managed to get myself a little confused during the setup, and after a few e-mails back and forth to support, it was up and running perfectly. I was able to customize it to the way we wanted to use it, and couldn't be any more pleased with how it's working. It's a bargain, too! Get it now! Easy and Simple for my accounts to use and Perfect for me to control. Comments: I want to extend a big thanks to Anthony and the support team. Filechucker and Userbase are the perfect tools for my business and perfect for my website. I have been using these programs in my site for almost two years and could not be happier with them. My clients love the ease of operation for them using my site. It has made my business grow and it is a pleasure now doing my work. Comments: FileChucker was easy to install on our website and serves our needs perfectly. Encodable Industries provided prompt replies and service when we were not sure if we had all of the settings right (us not being IT guru's). Anthony is excellent to work with and has helped us out with problems on our Website that were not of his making. Great Company and Great Program. Comments: Not only is this one of the best web apps I've ever used encodable customer service is exemplary. The owner is always only a few hours away and what little help has been needed (as the instructions to do stuff yourself are excellent) have been for customizing and they were very very fast. Do yourself a favor. Invest now. on top of it with a solution . I highly recommend. Comments: Easy to use and if you do have trouble, their support staff is always there to help! 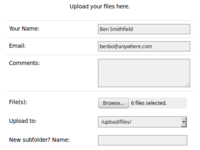 I really recommend using FileChucker for your personal upload application!